ConocoPhillips prides itself on being a great neighbor and a responsible citizen in the communities where we live and work. Our investment in the community is driven by relationships and to build these relationships we work with charitable organizations to identify community needs, and to deliver strategic programs that meet these needs, and support our business outcomes. Our Community Investments are organized within the following pillars: education, health and safety, natural resources, arts, civic, social services and disaster relief. In Malaysia, ConocoPhillips seeks to understand community needs and to support initiatives that meet those needs. Over the years, ConocoPhillips Malaysia has been supporting community initiatives across the country to support charities, education and community programs under the different pillars. ConocoPhillips Malaysia started supporting MyKasih ‘Love My School’ student bursary program in 2013 to support underprivileged school-going children from low income households. Every year, around 200 underprivileged students from four primary schools in Sabah and Sarawak are rendered assistance to pay for purchases of school books and stationery items from the school bookstore, as well as food from the school canteen via a contactless MyKasih student smartcard. Every year, ConocoPhillips continues to support Geology students from University Malaya (UM) and Petroleum Engineering students from University Teknologi Malaysia (UTM) as part of its commitment to the education for the local community. This is aligned with global Community Investment focus where education is one of the pillars. The Malaysian Philharmonic Orchestra (MPO) community outreach programme offers short informal recitals and special music presentations to community groups and institutions such as hospitals, orphanages, senior citizens’ homes, community and rehabilitation centers. For a number of years now ConocoPhillips has been supporting the MPO community outreach efforts as well as contribute towards the MPO annual charity concerts to raise funds for deserving non-profit organizations. ConocoPhillips Malaysia has been supporting the STAR newspaper for its Newspaper in Education (NiE) program since 2014. The STAR NiE program is aimed at helping school children in Malaysia to improve their English as well as Mathematics and Science using a special newspaper educational pullout. The Star-NiE trainers organizes hands-on training on how teachers can engage with students through using of newspapers at NiE workshops for teachers throughout the country. ConocoPhillips Malaysia has supported the Borneo Ecotourism Solutions & Technologies (BEST) Society’s ‘Living Water Project’ since 2011 in support of the organization's efforts to provide fresh water tanks to remote areas in Sabah as an alternative source of water for drinking and cooking. Our contribution has made a difference to some of the community in the rural areas of Sabah such as the Pitas district where clean water is a rare commodity. ConocoPhillips Malaysia joined other Oil & Gas companies to collaborate with PETRONAS and Malaysia Maritime Enforcement Agency (MMEA) and contribute towards the "Sahabat Maritim" program. The program involves promoting safe fishing activities in areas where oil and gas facilities are located through community engagement and education. “Sahabat Maritim” is a collaborative effort to address the dangers of fish bombing and fishing activities conducted within the 500-meter safety radius surrounding offshore operations by engaging with local communities. 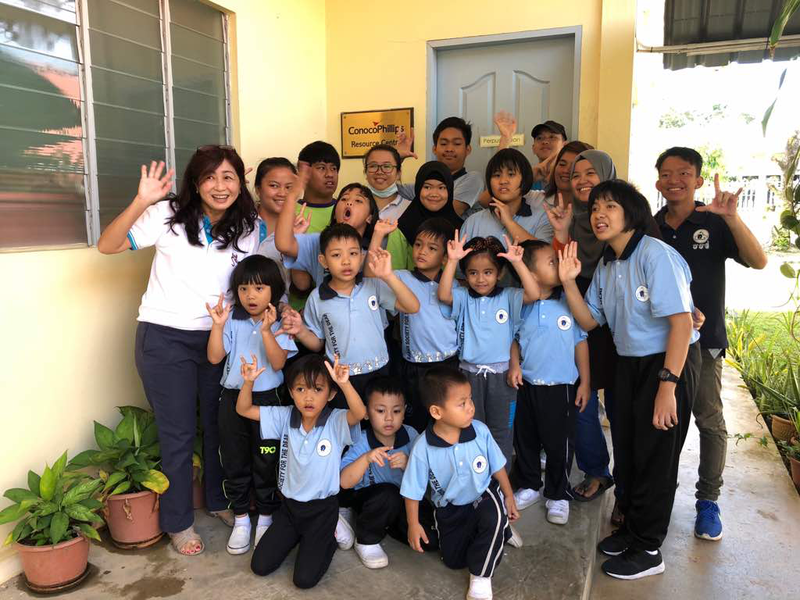 Since 2009, ConocoPhillips Malaysia has been supporting the Sabah Society for the Deaf to support hearing impaired children before entering primary school when government programs are more readily available. The Society has developed a library and purchase additional resources for the library with the funds ConocoPhillips have been providing. Every year, ConocoPhillips contributes to charities and homes for the underprivileged, physically challenged and orphaned children. Our contribution helps supports the day to day running of charities and homes.